What is the best eCommerce platform for 2019? The best eCommerce platform of 2019 is Wix for its user-friendly interface and comprehensive features. While primarily a website builder, this platform for SMBs and individuals offer a robust eCommerce module. This allows users to create attractive online stores where they can manage transactions from start to finish with ease. What’s more is the vendor offers affordable and flexible pricing plans. The increase in demand for eCommerce platforms gave the boost to the number of vendors seeking to provide you with solutions to manage an online store. But what sets the best platforms apart from the mediocre ones? Before you make that critical move to choose a vendor, always be clear on your business goals and allow it to dictate the right eCommerce platform for you. Like with any decision on investments, having the correct software solution is key to your business’ growth and even survival. In this article, we’ve prepared a comprehensive list of the best eCommerce platforms for 2019 and discussed their key features, including their main benefits, customization range, and scalability. What are the 20 best eCommerce platforms? More and more customers opt to shop online, a trend indicated by the sharp increase of Americans completing their holiday shopping using eCommerce. From 31% of U.S. shoppers in 2013 who chose to purchase online, online shopping rate in the U.S. increased to 61% in just 2 years. In five years’ time, that would balloon by around 70%, according to the latest study from Nielsen/FMI. In fact, the numbers continue to grow. 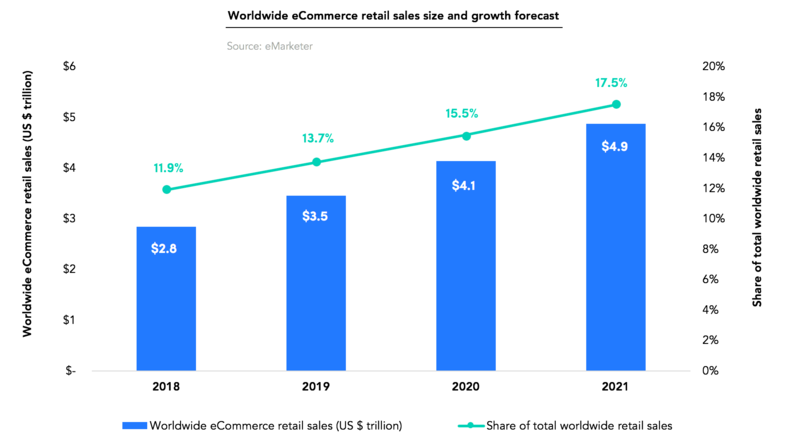 According to Smart Insights, online sales total is expected to balloon to $4.9 trillion by 2021, up from $3.5 trillion in 2019. It is no wonder that the eCommerce software space today is one of the most robust in the SaaS industry, with vendors vying for your business. Vendors promise to solve bottlenecks in your processes and help you win more customers. But with more choices comes the confusion. The list below aims to circumvent that issue; we did the sleuthing to help you shortlist your options. As we selected the platforms on this list, we looked at the fundamental features and capabilities that it must include. One of them is mobile optimization and responsive design as consumers nowadays prefer to purchase goods using their phones at their own convenience. Our no. 1 tool Wix is one such platform. It managed to come up on top not just because it is feature-rich but offers great value for money as well. Another essential feature is the conversion-oriented user experience. An interface with too many complicated steps or difficulty in finding the next step lowers conversion rates. This leads your customers to abandon their carts. With that, we chose products with a simple interface that enables your customers to complete a purchase in a few clicks. Moreover, we looked into the reliability of vendor support, the presence of an active community, integrations, and the software’s overall value for money. Meanwhile, if you need to know the fundamentals in eCommerce software, you can check our eCommerce software guide here. Without further ado, let us start discussing the 20 best eCommerce platforms for 2019. One of the leaders in eCommerce platform is Wix. At its core, it’s a powerful website builder that’s popular for stunning templates and ease of use. However, Wix also comes with a powerful eCommerce feature. Users can easily transform their website into an online storefront for their business. Once you have a site in Wix, adding Wix Stores automatically adds new pages to your site including a detailed product page, a shopping cart page, and a thank you page. Meanwhile, if you choose an online store template firsthand, you’ll no longer have to add Wix Stores as it’s already included and built-in. You can sign up for Wix free trial here. An area where Wix excels among others is how they beautifully showcase your products. Different types of galleries are available to display your products compellingly while customizable, professional-looking templates are offered to get you started immediately without technical skills required. Wix is more than just an e-commerce platform and website builder as it also has blogging tools that help you create content that connects with your customers and builds engagement. Wix gives you an optimized mobile eCommerce website so you can reach a wider scope of your customers using any device at any time and anywhere they are. Furthermore, Wix has numerous third-party apps and integrations to support your operations. Some examples include Zoho CRM, Xero, MailChimp, and QuickBooks, among many others. With that, it’s a flexible platform that suits small and medium-sized businesses but is robust enough to be used by larger businesses. Highly customizable galleries. With the importance of showcasing your products to attract customers, Wix gives you control over creating various product options (based on sizes or colors, for example), adding images and product descriptions, highlighting products on sale or with limited stocks, and customizing a special thank you message. Complete online store management. It’s a centralized hub where you can track your orders, sales, and inventory efficiently. Promoting sales and keeping in touch with customers is also streamlined. Simple checkout process. To prevent customers from abandoning shopping carts, you’re given a secure shopping cart platform for customers to complete their transactions and feel safe while doing so. Payment options are available via credit card and PayPal, among others while shipping and tax fees are automatically modified according to your customer’s location. Shopify is one of the most popular eCommerce platforms because of its end-to-end solutions for selling online, and it’s user-friendly as well. While other eCommerce products claim to be easy to use, they sometimes need you to invest hours in learning how it works. With Shopify however, you can immediately set up your online storefront since day one within minutes. Establishing your brand online doesn’t require design skills as Shopify provides over 100 free, professional-looking store themes and a custom domain. The drag-and-drop store builder enables you to easily customize your site’s imagery, colors, and fonts to reflect your branding. You can sign up for Shopify free trial here. This e-commerce solution fits the needs of SMBs and large enterprises. Optimized for growth, Shopify seamlessly scales with your business as it expands. You get your hands on insightful sales information through a comprehensive dashboard where you can access and understand your sales, audience, and orders better that are vital for making informed business decisions. Shopify also supports expanding your operations with other apps by seamlessly integrating with over 2,000 apps such as MailChimp, Kit, and Xero Accounting, among others. Ultimately, Shopify is a centralized, all-around solution for your business. Selling products and services is accomplished and managed in a unified hub with unlimited product inventory, single-step order processing, sales and growth trends tracking, and integration of new additional sales channels. Since it has a mobile app, you can even manage your online store anywhere and anytime. Meanwhile, your customers enjoy browsing through your website and completing transactions using any device as your online store in Shopify is mobile-optimized. Shopping cart and store management. Leveraging an effective online shopping experience, Shopify provides you with a shopping cart module that comes with SSL certificates for security, automatic carrier shipping rates, flexible shipping rates and free shipping, and access to over 100 payment gateways. Compelling online storefront. Shopify is a full-fledged blogging platform with a user-friendly interface and navigation which means you can maximize it to make content for your business. It’s easily customizable with free templates, own domain, and HTML and CSS with its website-builder and content management system. Streamlined marketing and SEO. An essential aspect of any business, especially for online stores, is marketing and SEO. The software guarantees your website is search engine optimized and integrates with social media platforms which means you can also conveniently sell on Facebook. 3dcart is an all-in-one eCommerce solution that’s packed with everything you need to build and run your eCommerce website. This software has a straightforward and focused approach when it comes to their services which you can utilize from hundreds of the features they offer. It is cloud-based so no installation is required to get you started. Customizing your website is accomplished with ease through full FTP access to your files and both free and premium themes. Professional web design packages are also available for those who don’t want to deal with CSS. It has free responsive themes to guarantee your website is mobile-friendly for customers using any devices. You can sign up for 3dcart free trial here. This app suits any type of user – an individual, a startup, a growing SMB business, and even a large-scale enterprise. 3dcart is built for serious internet marketers that need a robust platform with comprehensive feature sets. Beginners may find it overwhelming but professionals will appreciate the powerful offerings of this software that enables them to have full control over their customer’s online shopping experience. Integration and synchronization. With a few clicks, 3dcart syncs your products with Facebook, Amazon, eBay, and Google Shopping. It also works seamlessly with account management, tax solutions, and shipping software products. Fully-featured platform. 3dcart is packed with features to help you sell your products online. It increases conversion rates, reduces cart abandonment, incorporates SEO, accepts credit card payments, enables real-time shipping, and safeguards with VISA PCI certified security. A wide array of solutions. If you have specific requirements for your online business, 3dcart offers solutions for point-of-sale, B2B eCommerce, enterprise e-commerce, and shopping cart software, among others. Like several of the other platforms on this list, SITE123 is also a website builder at its core. However, it comes with built-in eCommerce functionalities that are designed for users with no coding or design experience. It allows businesses to create beautiful online stores from scratch. All you have to do is choose from their selection of web page templates, customize it according to your branding, and fill up the catalog with your product images and descriptions. The platform is even equipped with tools to help you manage transactions. From accepting orders to processing payments, this all-in-one platform can do it for you. If you would like to try these features out for yourself, you may sign up for a SITE123 free trial here. In addition to this platform’s robust set of eCommerce features, it also supports search-engine optimization so you can make sure that your online store gets the online visibility it needs. It also supports social media integration and email integration so establishing further connections with clients is easier. To top it all off, the vendor offers 24/7 technical support through their support center, via email, or even by online chat. This way, you can be sure that you are getting the assistance you need to maximize your platform. Robust online store builder. This software offers a module specifically designed for building online stores. It is equipped with tools for order management, inventory management, as well as payment processing via PayPal, credit card, or wire transfer. It even accepts multiple currencies, making it ideal for those who want to sell globally. With this, you can create eCommerce shops as well as manage them without relying on other platforms. Complete website support. SITE123 not only helps business owners create online stores; they also provide free hosting and free website domains. With this, you can ensure the speed and accessibility of your site. It even comes with built-in SSL/HTTPS encryption options to protect your site from any online threats. Third-party plugins. Customizing your website doesn’t have to end with its design. This is why SITE123 supports third-party plugins so you can attach a wide array of additional features to your website. This may include live chat functions, webmaster tools, or even analytics and marketing systems. Next on our list is Payability. While it doesn’t allow users to create online stores or manage orders, this financing solution for eCommerce businesses is great for speeding up transactions on Amazon. It allows businesses to get access to their earnings the next day after processing payments. This way, you don’t have to wait for weeks to get the money that you’re owed. Moreover, this is great for addressing gaps in your cash flow and prevent you from having to take out loans to fund your operations. To learn more, you can easily sign up for a Payability free trial here. In addition to their fast and risk-free financing options, Payability also doesn’t require any subscription plans or registration fees. They only charge 2% of your total Amazon Sales. This way, you can keep a steady cash flow instead of having to pay a fixed rate on a monthly basis. The only possible downside to this option is that it caters to Amazon Sellers who are earning $2000/month to over $1 million/month. If you have a small business that rakes in less than this on a monthly basis, you won’t be able to avail of their services. Fast transactions. Payability leverages same-day ACH or wire transfer for payments. This allows you to get your earnings on a daily basis rather than once a month. With this, you can pay suppliers faster, lowering costs and increasing margins. Risk-free financing. Unlike loans or other financing services, Payability bases their approval process on your Amazon account health rather than on credit. By doing so, you can be sure that you are funding your business using your own money and not burying yourself in debt. Seizing opportunities made easy. Because Payability lets you get your earnings quickly, it is easier for you to seize every opportunity that comes your way. Whether it’s stocking up on supplies that are currently on sale or purchasing items in bulk in preparation for Prime Day, this platform has you covered. Formerly named SellerPrime, SellerApp is an eCommerce software created for Amazon sellers. However, it focuses on analytics, competitor tracking, and business reporting. Using this, you can get in-depth insights into your online store’s sales data and optimize your operations. The platform also comes with portfolio analytics and consultation options to help you get real-time visibility of your performance. Furthermore, it provides intelligent alerts on stock levels, revenue status, and sales data anomalies. Should you want to try out these features for yourself, you can sign up for a SellerApp free trial here. With this platform at your disposal, all you have to do is collect your eCommerce site’s data and let this SellerApp crunch the numbers for you. It not only helps you see how you can improve your online store’s performance, it also gives you additional tools that can improve your Amazon ranking and optimize your product listing. This platform also supports email integrations and chrome plugins for your convenience. Simplified product watch. SellerApp allows users to have an edge against competitors by providing them with a robust Product Ideas feature. This tool helps you identify new selling opportunities, track competing products and sellers, as well as monitor industry trends. With this, you can stay at the top of your game at all times. Smart alerts. The platform is equipped with intelligent alert systems for a variety of situations. Whether there are changes in inventory levels, cash flow, or anomalies in sales performance, this platform will notify you in real-time so you can address the issue immediately. In addition, it also provides hijacker alerts, page rank alerts, and keyword index alerts. Business reporting SellerApp consolidates all the data related to your operations and gives you regular reports. This makes it easy for you to understand how your business is doing and adjust your eCommerce strategies accordingly. BigCommerce, a reliable eCommerce system with solutions catered towards B2Bs, small businesses, and enterprises. The platform provides you with all the essential features and tools to grow your business. Building fully-customized storefronts or picking from responsive eCommerce templates lets you create an engaging shopping experience for your customers. It’s also equipped with best-in-class conversion and marketing tools to help you drive more traffic, increase conversions, and sell across multiple channels. Setup is a breeze, taking only minutes. This intuitive system has little to no learning curve, allowing you to exploit its benefits immediately upon installation. The software comes with customizable templates so that you can create websites with your distinct look and feel. It also functions as a marketing tool enabling users to expand their audience, remarkably increasing their customer base. It has partnerships with shipping services so that you do not have to worry about shipping your products. This ensures that your goods get delivered on time, every time. Multiple channel support. Expand your product’s reach by making them available everywhere. Add your products to your Facebook shop, list them on Amazon, showcase them on Google Shopping, sell them on popular marketplaces such as eBay, and sync your sales online and offline with Square. Furthermore, a Buy Button lets you sell them on your blogs and emails, among others. Unified eCommerce hub. This software solution serves as an all-in-one hub. It is equipped with a channel manager feature that lets you take care of all aspects of your eCommerce business. From sales management to inventory management, this will give you a 360-degree view of your operations even if you have multiple online stores. A vast spectrum of apps and integrations. BigCommerce sports an extensive set of eCommerce capabilities that range from site hosting and transaction management to marketing and analytics. In addition to that, it also supports a wide selection of integrations on ERP, marketing, merchandising, inventory management, shipping, accounting, analytics, reporting, CRM, order management, sales channels, and B2B or wholesale. High-volume merchants need an enterprise eCommerce platform such as Shopify Plus with a level of scalability that can keep pace with their business as it grows. It’s a multi-channel platform with enterprise-grade selling capabilities that are built to automate and support high-demand sales, campaigns, and product drops. Sales channels across your mobile, social, and real-life business are optimized and centralized. This app adapts and evolves with your business environment which makes adding, updating, and managing products simple and straightforward even without codes. It also ensures your online storefront is beautiful and mobile-ready which you can customize based on your branding’s look and feel. Furthermore, it offers integrations with over 100 payment gateways such as PayPal, Amazon Pay, Apple Pay, and Shopify Pay’s exclusive one-field checkout all on your mobile device. Global storefronts and multi-channel sales. Eliminate barriers by launching global storefronts and new sales channels that are available in multiple currencies and languages. High volume buyers also get to access wholesales in various channels such as Facebook, Amazon, and eBay among others. Seamless API integrations. With a multi-channel eCommerce, ensuring that your app connects seamlessly with other major enterprise eCommerce platform integrations is crucial. The app has APIs to streamline the integrations by setting up your own custom solutions or enlisting among its Agency or Technology Partners. Primarily a POS software, Vend landed a spot on our list of best eCommerce platforms because of its intuitive online store management module. It provides users with functionalities for website building so that you can set up your eCommerce shop with ease. The software also supports transaction management tools that let you process orders and accept payments in just a few clicks of a button. Furthermore, this all-in-one solution comes with built-in customer management features so that it is easier to pinpoint repeat customers and provide them with a more personable service when they order. In addition to these features, this cloud-hosted platform is also completely mobile-ready so you can manage your online store on-the-go. Robust eCommerce capability. Vend is equipped with tools ranging from online store creation and order management to payment processing. It also offers advanced functions that allow you to deal with product returns and refunds as well as roll out loyalty programs for repeat customers. Built-in inventory management. The software comes with a robust inventory management tool that tracks your products at a granular level. With this, you can add a wide range of product variants as well as create inventory categories for product bundles. Offline mode. Don’t let unstable internet connection hamper your productivity. With Vend, you can get access to an offline mode feature that lets you continue your operations even without access to the web. Don’t worry, it will automatically synchronize your data as soon as you go back online. WooCommerce is a scalable eCommerce platform that suits the needs of both online store owners and developers. The software lets small and medium-sized businesses to sell any product or service – whether it’s digital or physical goods – on their online storefront. It gives you control over various aspects of running your business as it is open-source and completely customizable. It’s also enterprise-ready for merchants with a higher volume of sales. WooCommerce is built on WordPress, one of the most popular open-source platforms for creating websites and blogs, which makes it a trustworthy platform when it comes to its features and functions. Rich set of extensions. WooCommerce offers both free and paid extensions that span your logistical and technical requirements for your web store such as Facebook, Zapier, MailChimp, ShipStation, Stripe, PayPal, and UPS, among others. Geo-location support. To ensure custom tax calculations are correct, you can opt for your store’s location or enable geo-location support to detect the address of your customer. WordPress storefront integration. Eliminating the incompatibility of some plugins and themes, WooCommerce gives you Storefront, a free WordPress theme that deeply integrates with WooCommerce. Volusion is an eCommerce platform that offers small businesses all necessary tools and features to start selling online right out of the box. First off, it lets you create your own online store using its easy-to-use website builder and professionally-designed, responsive themes. You can then immediately start selling by easily adding products to your web store, uploading multiple images to showcase them, and managing your inventory. Getting paid for your goods is just as simple since the app accepts payments from PayPal, Stripe, and Amazon via its secure checkout experience. Finally, growing your business is optimized with built-in marketing tools, social management, all-in-one SEO tools, and at-a-glance reporting. Comprehensive eCommerce platform. Volusion is equipped with a rich set of features such as variant pricing, CSV product imports, special and flat shipping rates, customer profiles, admin social management, and reporting tools, among others. Robust integrations. The app offers advanced functionality with its certified technology partners such as FedEx, Amazon, Stripe, Hover, eBay, Facebook, and Twitter, among others. Credit card processing. Payments are collected at affordable rates with tech support, ironclad security, and zero setup fees for credit cards such as Visa, MasterCard, and American Express. Pinnacle Cart is a flexible e-commerce system that’s built to adapt to your business needs. It’s for entrepreneurs who have a specific idea of what they want their online business to be so they won’t be restricted by the platform’s structure. It adapts to your business, not make your business adapt to the software. With that, this app is highly customizable when it comes to business process improvement and feature development, for a start. Some more examples include customizing your control panel, slider, and landing page. It can also integrate with almost any third-party application as long as your preferred app has an API. Mobile Commerce, Pinnacle Cart’s mobile-ready site feature, is available for free which uses elements from your online store and can be viewed using any device as it has a responsive design. Sell on social media. Social media is more than just an effective marketing platform. PinnacleCart lets you utilize social media such as Facebook Commerce, Twitter, and Google+ in selling your products at no additional cost. Holistic and inclusive business growth approach. Since each company needs a specific recipe to grow their business, the app doesn’t just offer one or two services. Instead, it gives you a wide range of digital marketing services such as SEO, influencer marketing, content marketing, conversion optimization, affiliate management, and social media optimization, among many others. Impressive security options. With their PA-DDS certification, Pinnacle Cart allows users to safeguard their confidential eCommerce information from prying eyes. It also utilizes tight user permissions and provides you with a free SSL certificate with every new account. Yotpo offers a unique, yet vital, point of view for e-commerce platforms: listening to your customers. First and foremost, Yotpo is an app that helps brands collect reviews and images throughout a customer’s purchasing journey. By asking feedback from your buyers through personalized review requests, incentives and reminders, you can increase customer engagement and build their trust. Why is this essential for e-commerce? Garnering social proof helps increase sales as it showcases your photos, product reviews, and ratings. This is a key conversion point on your site. With partnerships with various marketing channels such as Google, Facebook, and Instagram, you can expect to get helpful insights for your relevant business decision-making processes. Integration with existing apps. Yotpo seamlessly connects with apps you’re already using in managing your business online such as Google, Facebook, Instagram, Twitter, Pinterest, HubSpot, Shopify, Magento, WooCommerce, Zendesk, Demandware, and BigCommerce. Review and marketing solution for eCommerce. The app generates content and easily helps you show them off easily with robust integrations that can increase sales, drive traffic, and leverage customer retention and loyalty. Comprehensive dashboard. Yotpo comes with a fully featured dashboard that displays your conversion and engagement data. With this, you get a 360-degree view of your online store performance, get insights on operational bottlenecks, and discover strategies to improve sales. Episerver Digital Commerce is a tailored eCommerce platform for various business types. While it’s user-friendly enough for any business, its industry-specific functionalities make it a good choice for some merchants. One of them is providing retail shops a built-in A/B testing feature and three kinds of personalization options to increase your conversion rates. D2Cs are given marketing and merchandising tools that range from email marketing, campaign management, and digital commerce and personalization to build a consistent and unified customer experience. It also caters to B2B manufacturers by reducing channel conflicts. Its multi-tiered functionality enables you to set prices according to types of customers and purchases to maximize revenue. Wholesale contributors get digital commerce sites with a streamlined display of their products, product catalogs, variable pricing, quotes, and orders for a more efficient process. Why choose Episerver Digital Commerce? Omnichannel marketing. Campaigns across various channels are managed using marketing automation tools. It also reduces the load on your behalf while keeping customer engagement with push notifications, real-time emails, and text messages. Scalable online catalog. With the way Episerver Digital Commerce is built, it allows you to start with a simple online catalog and, as your business grows, lets you add features and capabilities that you need for engagements and transactions. Pre-built connectors. Episerver Digital Commerce helps users streamline their operations by providing pre-built connectors. These allow them to link the software to their existing ERP, marketing automation, and PIM systems. Omnisend is a marketing automation system built specifically for eCommerce businesses. This omnichannel solution equips users with an intuitive content editor, top-notch data capturing tools, and powerful marketing features to help you increase conversions. It allows users to create beautiful newsletters to send out to specific customer groups, build targeted marketing campaigns, as well as boost the searchability of your online shop to increase visitors and conversions. Another great thing about this platform is that it comes with a reporting dashboard that gives you a 360-degree view of your sales, website visitors, and campaign performance. To top it all off, Omnisend can streamline your operations as it supports email integration, social media integration, and SMS. Robust eCommerce marketing tools. Omnisend allows you to leverage your online store data to learn more about the reasons for cart abandonment and to determine how to better attract leads using your eCommerce site. It also comes with robust campaign management features, A/B testing tools, and targeted messaging options to ensure that you are reaching your audience more effectively. Intuitive content editor. One of the best ways to increase conversions is to follow up on leads who have previously interacted with your website. You can either send them SMS or emails reminding them of the online shopping carts they may have abandoned or by letting them know what ongoing promos you are offering. Omnisend offers an intuitive content editor to let you do this without hassle. All you have to do is choose from their library of templates, customize it according to your branding, and add your content, and you’re ready to send it to your customers. Simplified lead management. Omnisend also offers lead capturing and subscriber management tools. With these features, you can easily gather information from your visitors, segment your leads, and manage each subscriber in the most personable manner possible. A self-hosted eCommerce platform, CS-Cart Multi-Vendor is a flexible tool for businesses from all industries. Whether you want to sell clothes, food items, or a mix of products, this software solution will allow you to build your own marketplace like eBay or Etsy. This lets you create shared storefronts where you can showcase products from multiple vendors. It comes with advanced payout systems, configurable vendor plans, as well as multi-level access that let you set privileges for particular sellers. Furthermore, administrators get access to detailed statistics and reports regarding the performance of the shops in your online marketplace. This eCommerce system is also equipped with individual administrative panels so that sales data, product catalogs, and other eCommerce information can remain separate for each vendor. Unique layout editor. CS-Cart Multi-Vendor utilizes a drag-and-drop navigation tool to allow administrators to customize their online marketplaces effortlessly. This can also be used by individual vendors who want to customize their product catalogs within the online marketplace. Seamless integrations. This platform supports over 80 payment and shipping integrations. With that said, it is much easier for your vendors to process transactions and deliver goods to their customers however they want. Mobile-responsive online storefronts. The CS-Cart Multi-Vendor platform is a completely mobile-optimized tool. This allows customers to access your online marketplace using their smartphones and tablets. In turn, you may also manage your marketplace while on-the-go. PayPro Global is an eCommerce platform specifically for businesses that sell software, services, SaaS, and digital goods online. With these tailored solutions, you can ensure you get exactly the tools and features you need for your online business. Setting up your account is accomplished within minutes to let you immediately start selling your products. SaaS solutions are given subscription management tools with sales models that range from freemiums, trials, and demo sales to cater to different customer profiles. As a cloud-based solution for digital-based businesses, PayPro provides you with everything you need to run your business online such as product management, campaigns, marketing, business reporting, advanced sales tactics, and order management, among others. Global reach. To support a global reach for your products and services that live online, the app enables you to facilitate over 70 payment options that are available in more than 110 currencies. Extensive localization is also available for your customers to enjoy a shopping experience in their own language on your product descriptions, emails and checkout pages. Mobile-ready. The app lets you manage your eCommerce operations on-the-go as it’s responsive to any device including desktops, tablets, and smartphones. Per-transaction pricing. PayPro has a different pricing scheme than other products: it charges based on a limitless monthly transaction for 4.9% + $1 or 7.9% (with a minimum of $1.95. Enterprise pricing is also available for a full CommerceCloud package and advanced tools that are priced per agreement. Swiftype may be a search application but it snagged a spot on our list for its ability to cater to eCommerce businesses. Equipped with advanced algorithms and language analysis tools, it helps online store owners make product searches faster and more convenient for their customers. By doing so, you can make the shopping experience better for online store visitors and eventually increase conversions. Another great thing about this software is that it can integrate with a wide range of third-party systems, allowing you to extend its functionalities as required by your business operations. Advanced search tools. In addition to its advanced algorithms and language analysis solutions, Swiftype also uses tools for bigram matching, stemming, phrase matching, and smart suggestions. With these, you can help your website visitors find the products they need faster, improving overall customer service. Powerful search analytics. Product search data can tell you more about your customers than you think. This is why Swiftype comes with a powerful search analytics feature. Using this, you can pinpoint the most popular items on your online site, understand the browsing behavior of your website visitors as well as determine where these visitors are from, making it easier to fine-tune your eCommerce operations. Unified database. Because of its cloud-hosted interface, Swiftype can easily consolidate your eCommerce store’s search data from multiple devices. This means you don’t have to worry about manually importing the information you need before you can start analyzing the data and making improvements to your operations. The specialty of Jazva comes in having a single hub to manage SKUs in multiple channels. It’s built for multi-channel retail key players that need a unified solution to oversee significant aspects of their e-commerce website. Product management, bulk listing, and automated repricing saves your time and increases your productivity by streamlining the process instead of manually listing each item on each of your sales channel, marketplace, and shopping cart solutions. It also gives you valuable insights into the performance of your sales and the seasonality of categories and variation items. Furthermore, it also has multi-store accounts, multi-tier pricing for B2B clients, and flexible listing capabilities for multiple listing profiles and channel-specific logos. Robust inventory management. Automation lets you manage your inventory easily across channels through features like multi-channel inventory control, multi-warehouse management, inventory forecasting, and inbound stock processing. You can even manage inventories across warehouses through your mobile app. Simplified order processing. Sellers with high-volume orders and different systems can benefit from syncing and centralizing orders, returns, and refunds. It also facilitates order prioritization and multi-tier support and pricing. Multi-channel shipping. From choosing the most convenient shipping method to selecting the most cost-effective shipping rate option, the app assists you with shipping integrations, multi-tier pricing, and carrier-rate shipping as per each parcel’s appropriate carrier, mail class, and box size. CLORAS is a simple to platform that integrates your ERP and eCommerce data to give you access to all essential data and metrics in real-time. It automatically and seamlessly handles the integration process so that users can focus on their online business. Integration endpoints are easily configurable through a visual dashboard. CLORAS is also customizable and scalable to meet unique business requirements. Implementing CLORAS is fast and easy, as users simply need to follow a straightforward three-step process to accomplish their digital eCommerce integrations. Security protocols are also in place to ensure that your data and all integrations are safe. Easy data synchronization. Synchronize all essential data between your multi-channel business. Advanced mapping. Utilize its visual dashboard to configure and map your data flow. Automatic integration. Effortlessly integrate ERP and eCommerce data. Data transfers are also securely handled by CLORAS. Manage Your Online Store Like You Would a Brick-and-Mortar Shop. Just because your store doesn’t have a physical location doesn’t mean you no longer have to interact with customers. It is not enough that you are able to provide them with a good selection of products, convenient transactions, and fast deliveries. Nowadays, customer service is the name of the game. You can add widgets to your eCommerce site to allow you to chat with customers and assist them as they shop. Another good idea is to integrate your store with social media accounts so that you can monitor the standing of your brand amongst target audiences. You may even use these integrations as a way to quickly respond to customers who are getting in touch with you via social media. Use Analytics to Your Advantage. AI and data analytics are great for determining the location, browsing patterns, and purchasing behaviors of your customers. This is why a number of eCommerce platforms offer these as part of their features. With these functionalities, you will be able to collect information on the leads and existing clients who frequent your website and come up with more targeted marketing campaigns and promotions that increase sales. Leverage the Power of Word of Mouth. This is may be one of the oldest tricks in the book but you can easily use it hand-in-hand with modern eCommerce strategies. Nothing beats the power of a glowing recommendation from a satisfied customer so why not allow them to share their thoughts about your products right on your online shop? There are plenty of plugins out there that can let you add commenting functions on your store. In addition to this, you might also want to consider making your product pages shareable on social media sites. This not only spreads the word about your products but your entire brand as well.